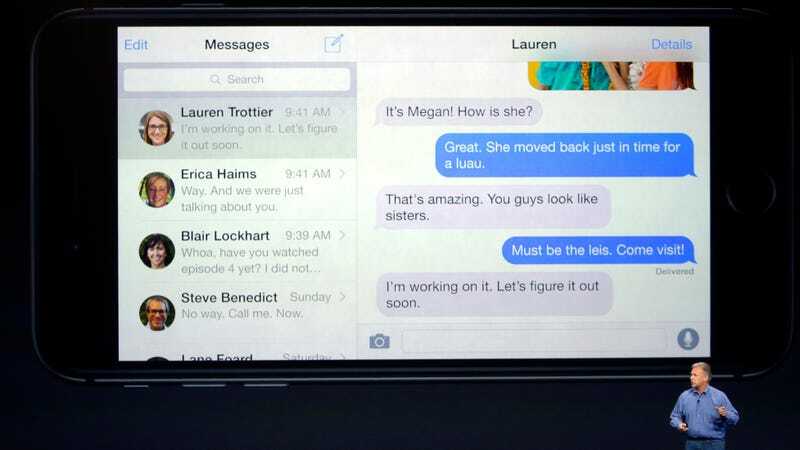 Apple’s senior vice president of worldwide product marketing, Phil Schiller, highlights iPhone 6 messaging features at a 2014 event in Cupertino, California. A federal jury in Texas has ordered Apple to pay out $502.6 million to VirtnetX Holding Corp., the kind of company often referred to as a patent troll, in the eighth year of contentious legal battles between the two companies, Bloomberg reported on Tuesday. VirnetX claimed that Apple’s FaceTime, VPN on Demand and iMessage features infringe four patents related to secure communications, claims that Apple denied. For VirnetX, the jury verdict in its favor could be a short-lived victory. The Patent Trial and Appeal Board has said the patents are invalid, in cases that are currently before the U.S. Court of Appeals for the Federal Circuit in Washington. As Ars Technica detailed last year, VirnetX is a publicly traded company that does offer some products including a “secure mail and messaging system called the Gabriel Collaboration Suite,” though SEC filings show they derive the entirety of their revenue from judgments in patent lawsuits. Per the Verge, the East Texas district was considered one of the most fertile court systems to pursue such cases, which have a higher chance of being thrown out elsewhere. But the Supreme Court ruled in 2017 that patent holders can no longer just choose where to file suit, bad news for the Texas city of Marshall, where an astonishing 25 percent of all US patent litigation was filed. VirnetX has previously pulled off this trick before, extracting $200 million from Microsoft in 2010 and later $23 million for updated products, according to Bloomberg.